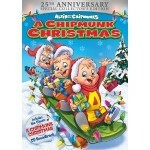 This video includes three special Alvin and the Chipmunks Christmas episodes. It’s a great collection, and one that will become part of your regular Christmas videos. These episodes tell different stories about Alvin, Simon, and Theodore, and Dave who is their caretaker, enjoying the wonders of the holiday season.